Walking on Water: All the King's Orphans Study Guide Release! All the King's Orphans Study Guide Release! I am so excited to release a 16 week correlating study guide to go along with All the King's Orphans! The message of who we are in Christ burns hot in my spirit and I am convinced that once we discover how loved we are, it changes everything! To show you how the two work together, read the free sample chapter I posted on hopelessness. After that, come back here and see how the two work together. Christians can often be the loudest promoters of hopelessness. Stop and consider how often you pass a church and is yard sign is either negative or condemning. Or both. In a world of brokenness and despair, Believers have somehow decided that the best way to win the lost is to pile more condemnation, worries and fear to the already overwhelming burdens so many carry. Satan stands at the gates of the Kingdom proclaiming his messages of fear and doubt – and we, the sons and daughters, are listening. Not only listening, but relaying his message - and pulling more and more of the church into our shared slavery to fear and despair. The Orphan Spirit has little to look forward to. His future is bleak and offers more of the same – or worse. 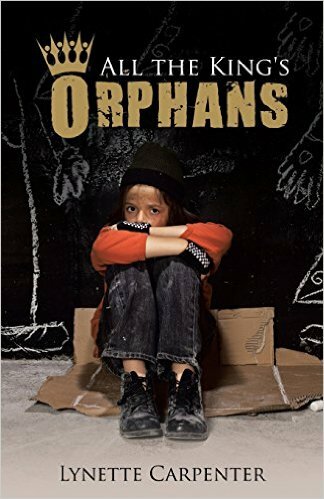 Though a child of the King, the Orphan Spirit lives a powerless Christian life on this earth. His only hope is that Jesus will come back soon to rescue His children from the brokenness of the world. But Jesus’ death wasn’t simply to offer us a free ticket to Heaven. No! His death was a victory over Satan, himself! The truth of the matter is that Satan has already been defeated and we are fighting from victory! We have the upper hand because of the Cross! have been living all their lives as slaves to constant dread. I believe that God the Father is inviting His children to stop looking out the Kingdom walls at all that Satan is doing and instead, turn our eyes towards Him – our Abba Father. Have we taken the time to learn who He is? Have we stopped to consider what He is doing? Have we asked what life He intends for us to live? Get to know your Abba – He is your hope! What does the Bible say about Hopelessness? If there’s one thing the Devil wants to do, it is to steal the life God intended for His children. John 10:10 tells us this very truth. You don’t have to look very far to find things to steal your joy. Satan jumps on every opportunity to build upon those anxieties. He does this by adding his own spin on what your future might hold. His lies pile high in our minds, tormenting you, robbing you of peace and binding you into a prison of fear. In this condition, it isn’t long before the Orphan Spirit sees nothing worth living for. Sons and Daughters learn the importance of identifying the lies and rebuking the enemy. We live in a time where bad news is so easily accessible. We have access to countless media sources and have the ability to feed our thoughts without reservation. It is imperative that we choose wisely what we will allow inside the gates of our mind. Always be on guard, knowing that Satan has a target on your head and knows that if he can gain control of your thoughts, he then has access to your heart. Put on the full armor, be alert and prepare yourself for his attacks. § What are my greatest fears? § Do my fears disrupt my daily life? § Do I have dreams and goals for my future? § What dreams have I given up because of hopelessness or fear? § Were those dreams a calling God put in my heart? § Do I believe that God is capable? § Can God be trusted with my life? § What areas do I need to trust Him more? § What am I missing out on because of the lies Satan is telling me? What are the lies I have been believing? § How can I be a catalyst of hope in my own church? For further study…read Numbers 14. Consider how fear kept the children of Israel living in a wilderness for an entire generation. They had a choice – trust in the One who had delivered them from slavery, parted the Red Sea and provided all their needs up to this point – or rely on their own abilities. They chose to act on how they felt and it cost them. 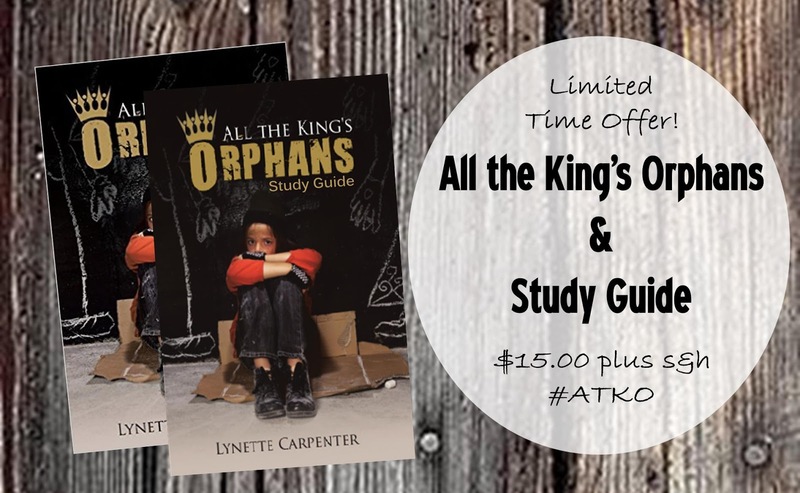 For a limited time, you can order both All the King's Orphans AND the Study Guide here for $15 plus tax and shipping.